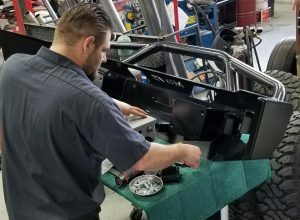 With our experience and knowledge of the automotive industry, Double A's Automotive & Performance was opened to give customers the ability of a third choice in auto repair. Locally owned and operated since 2012. We did not like some things with the aftermarket repair shops, and did not like some things with the dealerships. Thus, we took the best parts of both and ran with our dream. Double A's Automotive & Performance has the expertise to do anything from an oil change to an engine swap, to installing lowering kits, lift kits, full air ride suspension, and complete wiring on classic cars and trucks. We pride ourselves on working on all makes and models, including classic cars and trucks. Double A’s Automotive & Performance provides our customers with unsurpassed auto repair and outstanding customer service! We know that dealing with car issues is a hassle and most times stressful for our customers, which is why we believe that clear communication is vital. We employ only honest and dedicated professionals and strive to provide all of the information a customer needs to make an informed decision about their vehicle repairs. We deliver professional automotive repair and maintenance services AND we understand that your vehicle is a major investment. That is why we care for each customer's vehicle as if it were our own. Ask about our military discount, first responders discount, and teacher discount. We strive to do anything we can to help everyone keep their vehicles on the road! A customer is the most important person in our business. You are not dependent on us...we are dependent on you! You are not an interruption of our work. You are the purpose of it! Our services are not a favor. You favor us by letting us serve you. Bring us your needs...it'sour privilege to handle them. Thank you for being our customer! We value each and every one of our customers and stand behind our work better than anyone in the industry by offering you a 24 month or 24,0000 mile warranty on all repairs. We strive to provide you with such great service that you can't help but tell your family and friends about us, as well as return to us for all your regular service and repair needs. We hold the quality of our service and parts to the highest standards. You can be assured we are using correct parts, and all work done is inspected and tested before your car is returned to you. That is the Double A's Automotive & Performance promise. Tuesday - Saturday: 9 a.m. - 6 p.m.
Download our FREE Mobile App to use our Loyalty Program, Digital Coupons, and have access to everything Double A's Automotive & Performance offers at your fingertips!